Any dessert can decorate fresh berries, especially a fragrant strawberry. From a strawberry it is possible to prepare a gentle soufflé, an ice-cream cake. With strawberries, delicious creams, strawberry cocktails are obtained. 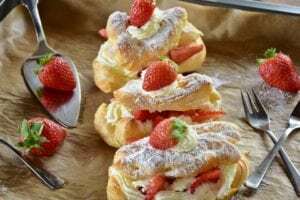 Try our recipes for desserts from strawberries. Cakes with strawberries and cream are a simple, tasty and bright dessert with fresh berries. 1. Melt the butter in the saucepan, add boiling water, salt, bring the mixture to a boil and pour all the sifted flour immediately. 2. Heat the mass over a low heat with constant stirring. When the mass is rolled into a single lump and it will be easy to separate from the edges of the pan, remove the pan from the fire. Allow the mass to cool slightly. 3. Whisk the eggs and add them in a flour mixture in small portions. You should get sparse dough. 4. Cover the baking sheet with baking paper. Put the dough with a pastry syringe. 5. Bake the custard in a preheated oven. After 10 minutes, lower the temperature of the oven and bake for another 15 minutes. During baking, do not open the oven door, otherwise your chiles may settle. Let the baked custard base cool. 6. For cream, evaporate the condensed milk with butter using a mixer. Cut the cavernous base in the middle, but not to the end. Put in a small amount of cream, close the cake. Sprinkle the finished cakes with powdered sugar. Serve with strawberries and mint leaves. Next PostNext What Is Star Anise And How Do I Use It?